If you fish for long enough, you’ll surely decide it is time to stop messing around and acquire the very best equipment you can. In terms of fish finders, this means selecting a unit that provides as many features and capabilities as possible, as well as flexibility and an intuitive interface. The Humminbird SOLIX 15 CHIRP MEGA SI GPS is the perfect option for such anglers, as it provides every high-end feature you could want, and it is certainly a contender for the title of “Best Fish Finder.” In addition to a large, 15-inch display screen, advanced scanning sonar functionality and included HD radar, the SOLIX 15 CHIRP MEGA SI GPS also provides touch-screen capabilities and gives anglers the chance to create their own sonar maps. Thanks to these features and more, Fishing Tech gives the SOLIX 15 CHIRP MEGA SI GPS an A+ Grade, while the entire SOLIX 15 Series, which includes the aforementioned model as well as a more affordable unit that does not provide MEGA Imaging functionality, earns an A rating. Many of Humminbird’s high-end fish finders come with MEGA Imaging capabilities, which provide better detail than traditional sonars can. MEGA technology uses sonar frequencies that are up to 3 times as high as the signals emitted by other fish finders. This enables the units to collect much more data than traditional units, and gives you the chance to see structure and fish in unprecedented detail. AutoChart Live is a custom-map-creating software package that allows you to make your own maps on the go. This way, you’ll be able to create a map of any water you fish; you’ll never have to pilot around the water blindly again. AutoChart Live can also be used to add information about bottom hardness and vegetation to existing maps and charts, when used with the included GPS module. Because touch-screen interfaces are great for some applications, while traditional buttons and control knobs are better in others, the SOLIX 15 CHIRP MEGA SI GPS features Cross Touch technology. With this, you can control any feature or navigate between the various screens of the unit using either the touch-screen interface or the traditional control panel. Like most of the company's other product lines, the Humminbird SOLIX 15 is available in multiple option packages. However, unlike the HELIX Series and a few others, the SOLIX 15 Series only comes in two different versions: The SOLIX 15 CHIRP MEGA SI GPS and the SOLIX 15 CHIRP GPS. Both models are helpful and easy-to-use; the primary difference between the two models is the inclusion of MEGA Imaging capabilities in the SOLIX 15 CHIRP MEGA SI GPS. Like most of the other Humminbird product lines, the SOLIX 15 is available in multiple option packages. However, unlike the HELIX Series and a few others, the SOLIX 15 Series only comes in two different versions: The SOLIX 15 CHIRP MEGA SI GPS and the SOLIX 15 CHIRP GPS. The SOLIX 15 CHIRP MEGA SI GPS is a feature-packed fish finder that includes a variety of basic and high-end features to help you find and catch more fish. A few of the most notable features and capabilities of the unit are detailed below. If you’ve ever used a fish finder before, you know that the water and weather conditions can significantly impact the function of a fish finder. But fortunately, the SOLIX 15 CHIRP MEGA SI GPS comes with SwitchFire technology, which makes it easy to see the fish and structure, no matter the weather conditions. With a single tap of the screen, you can go between MAX modes, which are ideal for providing as much detail as possible, and the CLEAR mode, which reduces screen clutter and noise, to help you see the fish in choppy waters. The SOLIX 15 is capable of imaging greater depths than most other fish finders on the market, particularly when it is used in conjunction with the 50-kHz transducer (not included). This makes it perfectly suited for offshore anglers, who are trying to find deep wrecks and other structure, as well as those pursuing fish lurking in really deep water. More than just a fish finder, the SOLIX 15 CHIRP MEGA SI GPS comes with an included HD radar module. Now, you’ll be able to navigate confidently in even foggy or rainy weather, as well as during low-light conditions. The solid-state unit is safe, effective and will help keep you safer while out on the water. Even if you are equipped with the best fish finder available, you won’t be very successful if you don’t know where to look for the fish. While experience and skill can often help you find your quarry, you’ll usually need a little luck too. However, the SOLIX 15 Series includes SmartStrike software, which predicts the locations of fish, based on the biology of various species, as well as seasonal and weather-related data. Although the SOLIX 15 CHIRP MEGA SI GPS is a great fish finder, it does have a few drawbacks. And while most of these are offset by the unit’s impressive features and quality, it is important to consider the strengths and weaknesses of any fish finder before making your final decision. 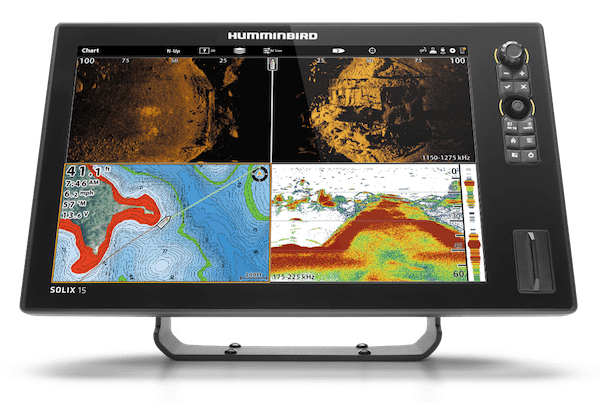 The Humminbird SOLIX 15 CHIRP MEGA SI GPS is the company's top-of-the-line product – you can’t find a model with more features or a larger screen than this unit. The only other Humminbird products that are roughly comparable to the SOLIX 15 CHIRP MEGA SI GPS are the SOLIX 15 CHIRP GPS and the HELIX 12 CHIRP MEGA SI GPS G2N. But both of these products are cheaper than the SOLIX 15 CHIRP MEGA SI GPS, and selecting either of these models will force you to forego one or more features. For example, as detailed above, the SOLIX 15 CHIRP GPS provides everything that the SOLIX 15 CHIRP MEGA SI GPS does, except for MEGA Down- and Side-Imaging capabilities. This presents a pretty clear-cut trade off: You can save $500 by opting for the less expensive unit, but you’ll have to do without the MEGA Imaging technologies provided by the more expensive model. On the other hand, the HELIX 12 CHIRP MEGA SI GPS G2N provides almost every feature and function that the SOLIX 15 Series does, including MEGA Down- and Side-Imaging. However, you’ll have to accept a screen that is 3 inches smaller than that of the SOLIX, and you won’t have access touch-screen capabilities, like the SOLIX offers. But, you’ll save nearly $1,000 in the process. Read our complete Humminbird HELIX 12 Review. There aren’t many perfect comparisons for the SOLIX 15 CHIRP MEGA SI GPS made by other manufacturers. The two units that are most similar to it include the Lowrance HDS Carbon 16 Fishfinder/Chartplotter and the Garmin GPSMap 7612xsv Chartplotter/Sonar Combo. Both units are more expensive than the SOLIX 15 CHIRP MEGA SI GPS, but they offer broadly similar features. All three units possess GPS modules and provide chart-plotting capabilities. They also have down- and side-imaging scanning sonars, and touch-screen displays. The Garmin unit retails for about $500 more than the SOLIX, while the Lowrance model will cost you an additional $2,000. Frankly, we can’t imagine many anglers struggling to choose between the SOLIX 15 CHIRP MEGA SI GPS and the Garmin GPSMap 7612xsv Chartplotter/Sonar Combo. The former has a screen that is 3-inches larger than the latter, and it also provides MEGA Down- and Side-Imaging capabilities, which will provide you with more detailed images than the Garmin unit can. It just doesn’t make sense to spend more money on a fish finder that just can’t compete with the SOLIX. Similarly, while the Lowrance HDS Carbon 16 Fishfinder/Chartplotter provides high-end down- and side-imaging technology that is roughly comparable to the MEGA Imaging used by the SOLIX fish finder and it features a slightly larger screen, it probably isn’t worth an extra $2,000. If you are ready to use one of the best fish finders available, you can’t go wrong with the Humminbird SOLIX 15 CHIRP MEGA SI GPS. It provides more capabilities than just about any other fish finder on the market, and most anglers have found it easy to install and use (aside from a few anglers who had trouble figuring out the interface system at the outset). You’ll have to drop a considerable amount of cash to pick up the SOLIX 15 CHIRP MEGA SI GPS, but most anglers are sure to find it worth the money. That, combined with the numerous helpful features it includes, help it earn an A+ rating.